The Congressional Budget Office (CBO) just released its annual report on “The Distribution of Household Income and Federal Taxes” analyzing data through 2011 on American household’s: a) “market income” (a comprehensive measure that includes labor income, business income, and income from capital gains), b) household transfer payments (payments and benefits from federal, state and local governments including Social Security, Medicare and unemployment insurance), and c) federal taxes paid by households (including income, payroll, corporate, and excise taxes). Some of the key findings of the CBO analysis are displayed in the table above, with the data organized by household income quintiles. The data in the first five rows above appear in the CBO report (from Tables 1 and 4), and rows 6-8 above have been calculated separately based on data from the first four rows in the table. 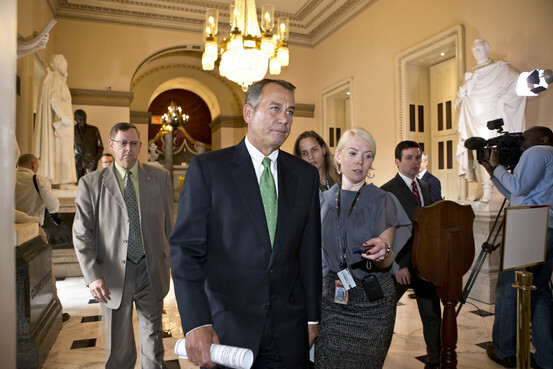 The CBO report received attention and commentary this week from John Merline at Investor’s Business Daily (“New CBO Report Explodes Tax Fairness Myths”), Reason’s Nick Gillespie (“3 Charts About Income Inequality, Transfers, and Taxes”), AEI’s Jim Pethokoukis (“Here is what’s really happening to middle-class incomes and inequality”), Heritage Foundation’s Curtis Dubay (“The Richest 1 Percent of Americans Pay 24 Percent of Federal Taxes”) and former economist Paul Krugman (“Why the One Percent Hates Obama”). Some additional analysis and commentary will be provided here that reveal a yet-to-be discussed major implication of the CBO report – almost the entire burden: a) of all transfer payments made to American households and b) of all non-financed government spending, falls on just one group of Americans – the top one-fifth of US household by income. That’s correct, the CBO study shows that the bottom three income quintiles representing 60% of US households are “net recipients” (they receive more in transfer payments than they pay in federal taxes), the second-highest income quintile pays just slightly more in federal taxes ($14,800) than it receives in government transfer payments ($14,100), while the top 20% of American “net payer” households finance 100% of the transfer payments to the bottom 60%, as well as almost 100% of the tax revenue collected to run the federal government. Here are the details of that analysis. 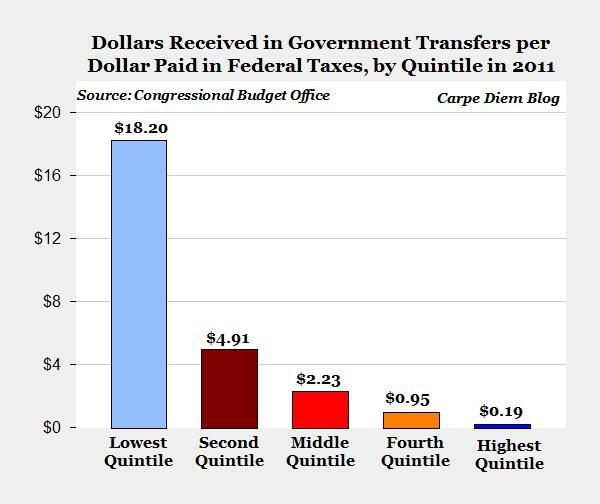 The figures in Row 6 in the table above (and displayed in the graph above) show the amount of federal taxes paid by the average household in each income quintile minus the average amount of government transfers received by those households in 2011. 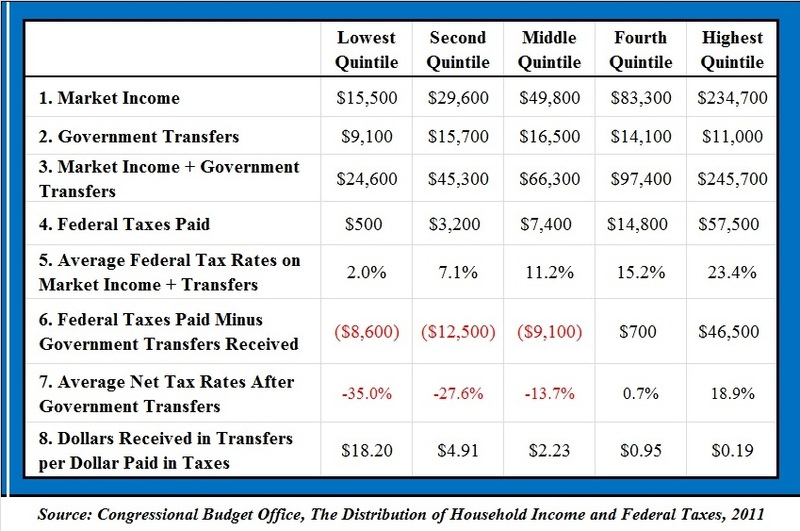 For each of the three lower income quintiles, their average government transfer payments exceeded their federal taxes paid by $8,600, $12,500, and $9,100 respectively, and therefore the entire bottom 60% of US households are “net recipients” of government transfer payments. Averaged across all three lower income quintiles, we could say that the lowest 60% of American households by income received an average transfer payment of about $10,000 in 2011. And because the government has no money of its own, where did those transfer payments come from to finance the “net recipient” households? Where else, but from the top two income quintiles, and realistically almost exclusively from Americans in the highest quintile. 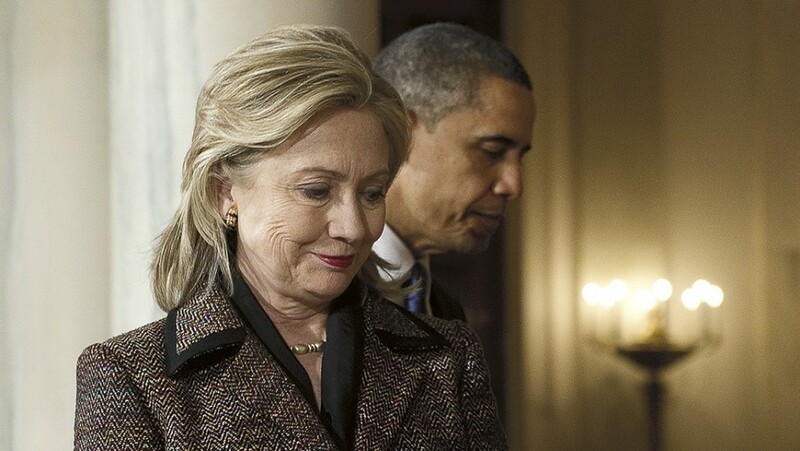 Specifically, the average household in the fourth quintile paid slightly more in federal taxes ($14,800) than it received in transfer payments ($14,100) in 2011, making the average household in the second-highest income quintile a “net payer” household in the amount of $700 in 2011. Basically, households in the fourth income quintile paid enough in taxes to cover their transfer payments, and then made a minor contribution of $700 on average to help cover the transfer payments of the “net recipient” households in the bottom 60% and make a small contribution to the federal government’s other expenditures. But the major finding of the CBO report is that the households in the top income quintile are the real “net payers” of the US economy. The average household in the top one-fifth of American households by income paid $57,500 in federal taxes in 2011, received $11,000 in government transfers, and therefore made a net positive contribution of $46,500. The second-highest income quintile basically just barely covers its transfer payments, so it’s really the top 20% of “net payer” households that are financing transfer payments to the entire bottom 60% AND financing the non-financed operations of the entire federal government. Here’s another way to think about the burden of the “net payer” top income quintile. The average household in that income quintile made a contribution net of transfers in 2011 in the amount of $46,500. That would be equivalent to the average household in the top quintile writing four checks: 1) one check in the amount of $8,600 that would cover the average net transfer payments of a household in the bottom quintile, 2) another check for $12,500 to cover the average net transfers of a household in the second lowest quintile, 3) a third check in the amount of $9,100 to cover the average net transfer payments to a household in the middle income quintile, and 4) then finally writing a check for the balance of $16,300 that would go directly to the federal government, which for the households in the quintile as a whole would have covered almost 100% of the non-financed federal government spending in 2011. So except for a small contribution net of transfers in the amount of $700 from the average household in the fourth quintile, the highest income quintile is basically financing the entire system of transfer payments to the bottom 60% AND the entire operation of the federal government. And yet don’t we hear all the time that “the rich” aren’t paying their fair share of taxes and that they need to shoulder a greater share of the federal tax burden? Hey, they (the top 20%) are already shouldering almost the entire federal tax burden along with almost the entire system of entitlements and transfer payments! And that’s not “fair” enough already? The chart above shows another way that the CBO data reveal an extremely unequal distribution of government transfer payments and federal taxes by displaying the ratio of “dollars received in government transfers per dollar paid in federal tax revenues” by income quintile in 2011 (these data are from row 8 in the table above). The average household in the lowest quintile received $9,100 in government transfer payments in 2011 and paid only $500 in federal taxes, for a ratio of $18.20 in transfer payments for every $1.00 paid in federal taxes that year. In contrast, the average household in the top income quintile received $11,000 in government transfers in 2011, but paid $57,500 in federal taxes, for a ratio of 19 cents in government transfer payments per dollar paid in federal taxes. 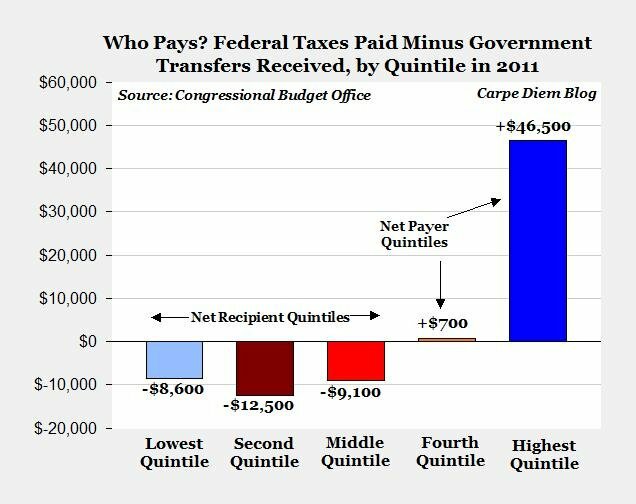 This analysis is a further illustration that the bottom three quintiles are “net recipient” households that received more than $1 in government transfer payments for every $1 paid in federal taxes in 2011, while households in the fourth quintile were minor “net payers” in 2011 and received slightly less than a dollar in transfer payments on average ($0.95) for every $1 paid in federal taxes. “Net payers” in the top quintile received only $0.19 in government transfer payments per $1 paid in federal taxes in 2011. 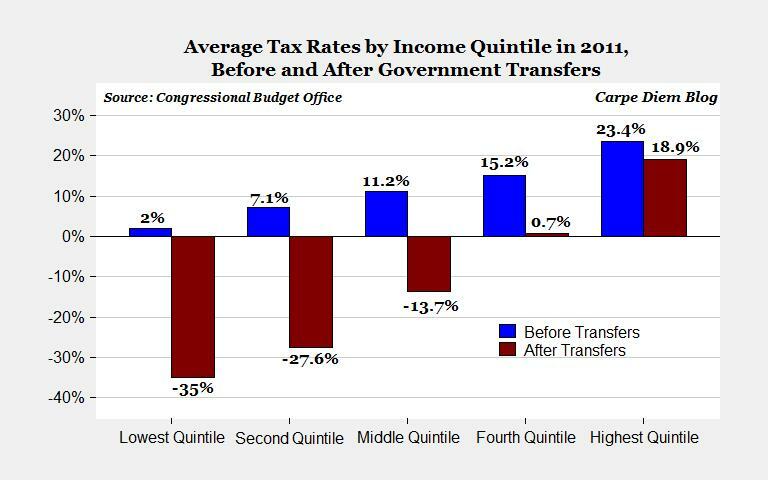 This final chart shows average tax rates by quintile in 2011, both before and after government transfer payments. The blue bars in the chart show the average tax rates by income quintile from the CBO report (Table 4) and are also displayed in the top table above in row 5, calculated by dividing federal taxes paid (row 4) into “Before Tax Income” (row 3, Market Income + Government Transfers). Adjusting for government transfers received, the brown bars in the chart are calculated by dividing “federal taxes paid minus government transfers received” (row 6 in the table) into Before-Tax Income (row 3), and show average tax rates by income quintile after government transfers. For example, the average “net recipient” household in the lowest income quintile received a “negative tax” payment of $8,600 in 2011, had an average before-tax income of $24,600, for a negative tax rate of 35%. Reflecting their “net recipient” status, all three lower income quintiles had negative average tax rates in 2011, and only the “net payer” households in the top two income quintiles had positive after-transfer tax rates of 0.7% for the second-highest quintile and 18.9% for the top quintile. This further demonstrates that after transfer payments, households in the bottom 60% are “net recipients” with negative income tax rates, while only the top two “net payer” income quintiles had positive tax rates after transfers in 2011. The CBO study released this week provides ample evidence that the richest Americans are paying their “fair share” of federal taxes. In fact, the richest 20% of Americans by income aren’t just paying a share of federal taxes that would be considered “fair” — it goes way beyond “fair” — they’re shouldering almost 100% of the entire federal tax burden of transfer payments and all other non-financed government spending. What’s probably not so fair is that the bottom 60% isn’t just getting off with a small tax burden or no tax burden – the bottom 60% are net recipients of transfer payments from the top 20% to the tune of about $10,000 per household in 2011. So maybe what the CBO report shows is that we should be asking whether or not the bottom 60% are paying their fair share when they’re not paying anything – they’re net recipients of transfer payments that come from “the richest” 20% of American households. When the top 20% of US households are financing almost 100% of the transfer payments to the bottom 60% and financing almost the entire non-financed operating budget of the federal government, I’d say “the rich” are paying beyond their fair share of the total tax burden, and we might want to start asking if the bottom 60% of “net recipient” households are really paying their fair share. HT: I owe the inspiration for this post to Morgan Frank, who provided the original idea, discussed the development of the main ideas, and also suggested several of the charts above. Update: As Morgan points out in the comments, it’s important to note for the discussion here that the US has the most progressive tax system among all OECD countries, see the Tax Foundation president Scott Hodge’s article “No Country Leans on Upper-Income Households as Much as US.” Specifically, the top ten percent of American households pay 45.1% of all income taxes (both personal income and payroll taxes combined), which is the highest of any of the 24 countries in the OECD and far above the 31.6% average. Adjusting for the income share of the top ten percent, the US has the highest ratio of tax share (45.1%) to income share (33.5%) for the top decile of 1.35 times, compared to the OECD average of 1.11. Mark J. Perry is concurrently a scholar at AEI and a professor of economics and finance at the University of Michigan’s Flint campus.